Robust construction using metal-to-metal fasteners and wood dowels. Durable, high-performance particleboard body. Scratch-, spill- and stain-resistant laminate withstands heavy use. Inset drawer fronts and picture-frame style. One locking pencil and one locking file drawers. Metal support feet coordinate with the steel worksurface legs. Open shelf for active projects. Distinctive, custom-designed metal drawer handles. Steel ball bearing drawer suspensions operate easily and quietly. Remarkable performance at an affordable price. Innovative design and unparalleled quality for the price. Robust construction using metal-to-metal fasteners and wood dowels for a solid feel and lasting performance. Durable, high-performance particleboard body. Scratch-, spill- and stain-resistant laminate withstands heavy use. Inset drawer fronts and picture-frame styling provide an informal, contemporary effect. 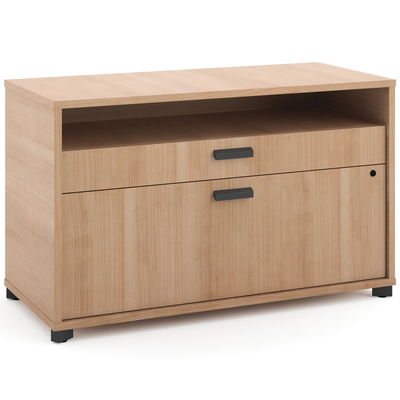 One locking pencil drawer and one locking lateral file drawer keep contents safe and secure. Metal support feet coordinate with the steel worksurface legs. Open shelf for active projects. Distinctive, custom-designed metal drawer handles. Steel ball bearing drawer suspensions operate easily and quietly. Use as a stand alone unit or fasten to a basyx® Manage™ Series Work Wall (sold separately) for added privacy. It can be partially nested under a basyx® Manage™ Series Worksurface (sold separately) to create L-shaped configuration.